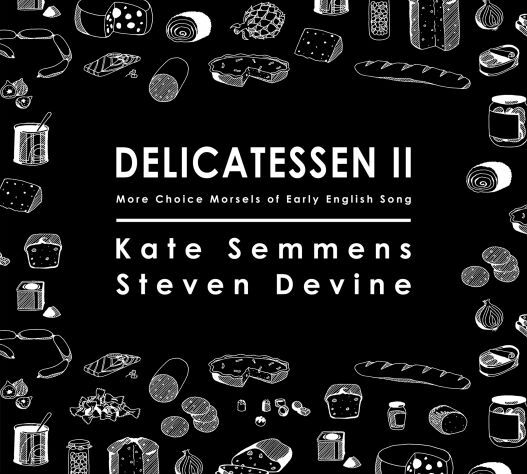 Following on from their earlier CD Delicatessen, Steven Devine and Kate Semmens delve further into the English song repertoire of the 17th and 18th centuries, with the imaginatively entitled CD Delicatessen II. As the programme notes explain, the rapid move to town and cities and the decline of rural life may well have contributed to the yearning in popular song for the pastoral life, in this case, a close memory rather than the mythical Arcadian fantasy world of most of the songs. This recording draws on sources such as the 1756 ‘Appolo’s Cabinet: or the Muses’ Delight’, clearly aimed at amateurs with its attendant instructions for singing and instrumental playing. In contrast to these simple settings are more substantial pieces by the famed composers of the day, such as John Stanley, Thomas Arne, Maurice Greene, John Blow, and William Boyce. The programme avoids the frequent orchestral arrangements of the period, sticking to songs specifically intended for keyboard and voice. Organists weaned on the Voluntary’s of the famed blind organist John Stanley will love his vocal contributions, demonstrating just how close was the world of church and popular musician during the 18th century. Kate Semmens sings with vocal focus and delightful attention to the words and the mood of the music, although I would have preferred less vibrato in her voice which, although relatively slight by some standards, has a persistence and pulse that has the unfortunate effect of making her voice sound rather nervous and also affects her intonation. That said, she is to be praised for some very well articulated ornaments and properly executed trills – the latter something of a rarity amongst singers. She does manage to rein much of the vibrato in for the gorgeous final piece, John Blow’s Lovely Salina, a piece that stands proudly alongside the many Italian ground bass songs of the earlier 17th century and reinforced my view that John Blow is unjustifiably overlooked in his own country. Amongst the harpsichord solos is an impressive four-movement ‘Lesson No 1’ by Eliza Turner (d.1756) from her Collection of Songs with Symphonies and a Thorough Bass with Six Lessons for the Harpsichord. The lively opening Allegro is followed by movements called Scotaza Moderato and Tambourin Allegro both in styles that suit their titles. The latter is given some nice added twists and turns by Steven Devine. I wonder if a future recording could be of Eliza Turner’s songs and keyboard pieces. Other solos included a Lesson by Maurice Green and a Sonatina by James Hook. It is worth noting that only two of the songs on this CD (both by the mysterious ‘William Jackson of Exeter’) include a written-out (obligato) harpsichord part. The accompaniments to all the others are improvised from a single bass line – one of the lesser-known marvels of keyboard players. In what is something of a family enterprise, credit is due to Emma Jane Semmens for the imaginative illustrations and sleeve design, which folds out into a cruciform shape. Further details and purchase options can be found here.